The Jette Parker Young Artists Programme is designed to support the artistic development of talented singers at the beginning of their career. Young Artists are employed as salaried members of The Royal Opera over a two-year period, during which time they are immersed in the life of the Royal Opera House to help them form their own artistic identity and give them guidance on their trajectory through the business. A wide range of freelance coaches work for the Programme on a regular basis, teaching movement, stage fighting and stagecraft as well as music. Language is very important, including both conversational and sung Italian, French, German and Russian, as well as Czech, Spanish and, for Young Artists from abroad, English. Masterclasses and individual coaching with leading international singers, conductors, directors and other opera professionals are organised throughout the year. The Programme is extremely grateful to the Royal Opera Music Department for its generous support in the form of free coaching whenever Royal Opera music staff are available. Each singer studies major roles with the Programme's Artistic Director, David Gowland, and with the music staff and language coaches of The Royal Opera. Young Artists sing small roles in productions on the Royal Opera House's main stage and cover larger roles. They also have the opportunity to observe every phase of the rehearsal and production of operas for the main stage. Every facility of the company is made available to them so that their talents can be nurtured through total immersion in the life of the Royal Opera House. Concert work is another important part of their training and regular performance opportunities for the Young Artists include recitals in various venues. They also participate in the Royal Opera House's education work in schools and at the Royal Opera House. Each season, the Young Artists participate in a chamber opera in a small scale venue and give a performance on the main stage of the Royal Opera House. The opera répétiteurs and conductors on the Programme join the music staff of The Royal Opera for rehearsals and stage duties of new and revived productions. In addition, they coach the Programme members and play for language, stagecraft and movement sessions as well as auditions. They also benefit from the language, movement and other general coaching offered by the Programme and receive mentoring from the Music Director of The Royal Opera and other conductors working with The Royal Opera. In September 2008, the Programme was expanded to include a répétiteur and/or conductor associated mainly with The Royal Ballet. They join the music staff of The Royal Ballet for rehearsals and performance duties of new and revived ballets. They receive mentoring from the Music Director of The Royal Ballet, but are also integrated in the Programme by playing for the singers' stagecraft and movement sessions and benefiting from the language, movement and other general coaching on offer. The stage directors act as assistant directors on Royal Opera productions, stage the Jette Parker Young Artists chamber opera and are responsible for the staging of the annual main stage performance. They benefit from the language, movement and other general coaching offered by the Programme, work with the other Young Artists in workshops and are assigned a mentor from the Royal Opera House's permanent stage director staff. In the 2006/7 season, a new position, Jette Parker Principal, was created, aimed at fostering a continuing association with former Young Artists while supporting their further development. Recipients are offered a one-year contract allowing them to work for The Royal Opera, while retaining access to all the coaching facilities of the Programme. The position is an occasional one, only offered when a suitable balance of Royal Opera roles is available and it is believed a singer, director or conductor will benefit from the continuing support of the Programme and the resources of the Royal Opera House. In addition, the Programme offers music and language coaching to former members. 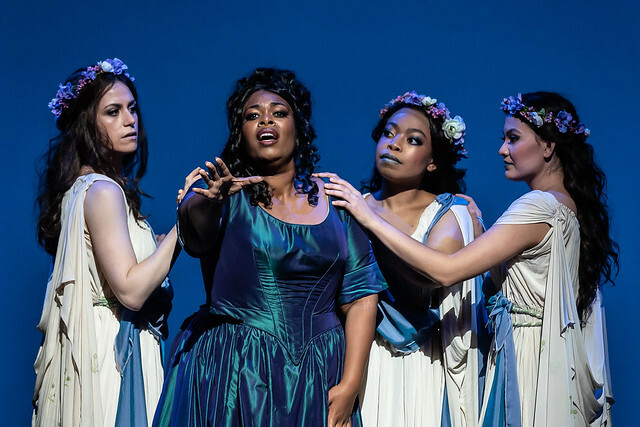 Alongside the core two-year programme, the Jette Parker Young Artists Programme actively supports singers, conductors, répétiteurs and stage directors from diverse backgrounds that are currently under-represented in the Company’s talent pool through the Link Artist scheme. Link Artists are able to attend rehearsals and to access the specialist support of the Programme’s staff and visiting artists. They receive bespoke coaching and career guidance as well as workshop and performance opportunities around their existing professional commitments. This Season’s Link Artists are soprano Sarah-Jane Lewis, conductor Sonia Ben-Santamaria and director Anthony Almeida.